Does it feel more comfortable to know “why” when these murders happen? Of course it does. As humans, it’s our nature to want to know why. But the reality is that it is an extremely rare circumstance that we ever truly know why anybody kills. Oscar was a gun owner and gun enthusiast, by his own admission. Based on evidence presented at trial, his gun was partially for protection and partially for bravado. He admittedly carried it around wherever he went and acted carelessly with it on more than one occasion. Is this important to the case? Yes it is. It shows that it’s “possible” for something to go wrong. Is it a reality that people who own guns versus people who don’t own guns have a higher risk of injury or death? Yes. This is not a PSA on gun dangers; it is simply an acknowledgement that somebody in possession of a deadly weapon is capable of causing death. And then add in Oscar’s penchant, and again his own admission, for becoming frustrated easily, having a short fuse and often being stressed out. The two are a dangerous combination. You don’t need to be a monster, a sociopath or even a terrible person for a killing to happen in a bad moment under these conditions. It happens every day to very average people. But back to my original point for this post… does any of that really matter to the verdict? I say, no, it does not. 1. When presented with a moment that OP perceived to be dangerous, he consciously chose to retrieve his weapon. Whether you believe his story that the window opening startled him, or believe the State that he and Reeva were in a fight, it is common cause that he retrieved his weapon for a purpose. 2. OP was adequately trained on this weapon. 3. OP consciously chose to keep this weapon loaded and one up at all times. 4. OP consciously removed the holster and safety from the weapon during the incident. 5. According to OP, he consciously chose to keep the lights off so as not to give away his position. 6. According to OP, he consciously yelled at THE PERSON to get out of his house. 7. According to OP, hearing the toilet door slam and seeing it closed solidified for him that A PERSON was inside of the toilet room. 8. OP was aware that he was not the only person in the house that night – he knew Reeva was there in the very same bedroom suite with him. 9. He never asked/didn’t try to identify who was in the bathroom. He just knew it was A PERSON. 10. According to OP, his finger was consciously on the trigger of his loaded, one up, weapon. 11. 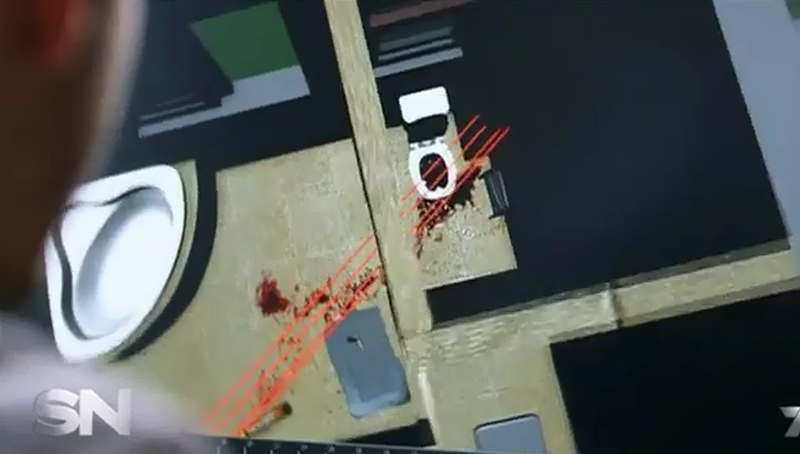 Although not admitted by OP, his gun was aimed directly at the toilet door. Behind that door was A PERSON. The ballistics evidence proves that the shots were not wild – they were consciously pointed at the door. OP slipped up when he said he didn’t fire a warning shot in a different direction because the bullet could have bounced off of the shower door and hit him. He was aware and conscious of his own safety and in which direction he was shooting – pointing it towards THE PERSON. 12. Admitted by OP, a noise in the toilet room, which would have been caused by A PERSON, prompted him to shoot. 13. He shot four times. 14. He left the gun, with remaining bullets, cocked and ready to fire. This means, he consciously stopped shooting at some point. He didn’t empty the entire gun. He stopped after four. A conscious act. 15. THE PERSON in the toilet room never spoke a word, was never seen, never indicated that they had a weapon and never presented a threat. This is not putative self defense. Hearing a window open in the bathroom when you are sharing your bedroom with a person that you are aware is awake, is not sufficient cause to believe that you are under attack and you have no choice but to kill. 16. OP cannot logically claim that every single action he made that night was carefully thought out, except for one, the four shots that killed Reeva. It doesn’t work that way. No experienced Judge, or quite frankly, clearly thinking person, would ever believe that a person who has been deemed mentally competent by a team of psychiatrists and a psychologist “wasn’t thinking” when he pulled the trigger, considering all of his earlier actions during the incident. THIS IS WHY I BELIEVE THAT HE HAS BEEN PROVEN GUILTY OF MURDER, NOT CULPABLE HOMICIDE. HE SHOT AND KILLED WITH INTENT. 1. The fans and the balcony light. When the incident first happened, OP claimed that he had to go “out” on to his patio to retrieve his fan. Now on the stand, the fans were never outside, just halfway outside in the doorway. He never had to go “out” to move anything. In fact according to Oscar’s version, he was only standing a few feet away from where Reeva was in bed, she was awake AND the balcony light was on. The likelihood that he would be clueless that she moved is very slim. He had to add in the second fan, because two fans were found in the room and it takes longer to move two fans than one. He screwed up though when he told the court that both fans were left on the entire night. The police found one fan in the corner, unplugged, and the other fan was in front of the door (unmoved) and not on. His story does not match the physical evidence. 2. The right side of the bed. That area was cluttered with cords, iPad/iPad cover, shirt, clippers standing up on a charger. Yet, OP claims that he walked around that area on his stumps, and later sat there to put on his prosthetics which had been left in that same area. His account of walking around in that area during the incident cannot be possible with the items on the floor. 3. The duvet. It was found on the ground in front of the bed (blocking a clear entrance to the balcony). It also had blood spatter on it which was very likely caused when OP carried Reeva’s body out of the bedroom. If the duvet was lying in that area during the incident, it would have been impossible for OP to run to the balcony and open the doors, especially on his stumps, without falling. He did not testify to falling. Instead, he testified that the duvet was absolutely always on the bed and the police moved it. The physical evidence does not support these false claims. 4. Lack of bloody hand prints. OP was covered in blood after pulling Reeva out of the toilet room. We saw the photos of him that morning. He claims he had to deactivate his alarm (on a remote) to get out of his bedroom, then he had to unlock the bedroom door and open it, and then run downstairs to open the front door. There was no evidence presented of bloody hand prints on his alarm remote, bedroom door, front door or iPhones. Why? There are a few possible reasons: He either ran out of the bedroom and downstairs to open door and make calls BEFORE he pulled Reeva out of the bathroom (which would be inconsistent with his story) or he washed his hands immediately after he pulled her out of the bathroom before calling anybody or going downstairs. There is no dispute that he made some calls within minutes after the shooting. If there are no bloody prints on the 0020 phone that was used, then he either washed his hands first or he hadn’t pulled her out of the bathroom yet. Both scenarios do not match his story of desperately battling to get her out of the toilet room immediately upon thinking it was her in that room. Something doesn’t add up here. 5. The screams. OP claims that Reeva never uttered a single word during the entire event from the point that he got out of bed, even though she was awake (and he states that he knew she was awake). However, multiple witnesses distinctly heard a woman’s voice and a woman’s screams before and during the gunshots. Mrs. van der Mewre heard a woman’s voice arguing from 2am-3am, when OP and Reeva were supposedly asleep according to OP. Burger, Johnson, and both Stipps heard terrified female screams up until the last bangs. Then silence. The only way that the defense could try to explain this was to say that Oscar screams like a woman and every one of the witnesses was mistaken. They claimed they would prove in court that he screams like a woman, they even did audio tests prior to trial, yet nothing was ever played for the court. Obviously those tests failed as miserably as OP’s own testimony on the stand. The ear witnesses that the defense brought to trial, Nhlengethwas and Motshuane, ended up supporting the state’s case. They stated they heard a man crying after the bangs. The fact that they saw the security vehicle/Stander’s mini-cooper within minutes of hearing the cries, fits the timeline that the gunshots were at 3:15+ (not earlier as the Defense says). When trying to understand some of the differences in ear witness testimony, it is essential to identify who heard screams and who heard cries. The people who heard screams, heard them BEFORE THE BANGS. They all identified those screams as a woman. The people who heard cries, heard them AFTER THE BANGS. They identified those cries as a man. Reeva screaming before the shots. Then silence = death. Then Oscar crying afterwards. Use that equation when listening to the ear witness testimony, and it tells the story! 6. Stomach contents. I recognize these are highly subjective. 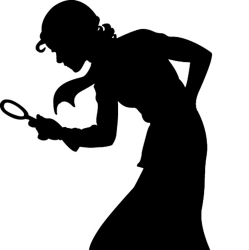 But it is relevant circumstantial evidence in that it supports the van der Mewre evidence of hearing a woman around 2am that morning. It opens up the window of opportunity that Reeva was indeed awake and not asleep as OP states. 7. The bathroom light OP testified that the bathroom light was off during the gunshots. He didn’t turn it on until later, after running from room to room. Annette Stipp, who was awake at the time of the first bangs, around 3am, saw the bathroom light on immediately after hearing the bangs. Dr. Stipp also saw it on. That bathroom light was on during the event! This is a huge discrepancy in Oscar’s story. 8. The aim OP refused to admit that he aimed at the door during his testimony. He claims his gun was pointed in the general vicinity of the door (paraphrasing a bit here). 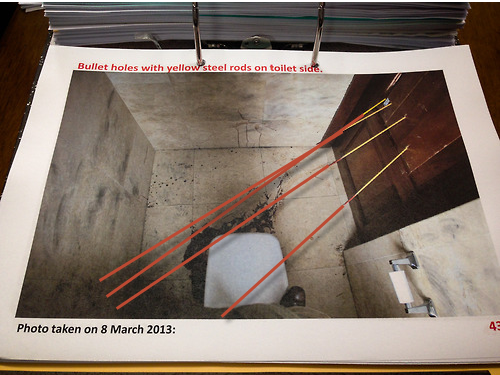 But the trajectory of his shots not only support that he was aiming at the door, you take a look at this picture and decide for yourself if he was pointing at Reeva. Ballistics proved that there was time between the first shot (the hip) and the subsequent shots when she was down on the magazine rack. He shot once, and then continued to shoot three more times. Three of those bullets hit her. 9. The police/security. On one hand, OP states that he is extremely security conscious and has outfitted his home with all sorts of extra security measures. He states that when he initially heard a noise that he perceived as an intruder, he repeatedly yelled to Reeva to call the police. Yet, he never used his panic alarm and he never once asked the police for help. He claims he does “not remember” speaking to security guard Baba at all that night, yet Baba testifies that Oscar did speak to him and told him “everything is fine”. OP is able to remember other phone calls that he made just moments before, but does not remember the suspicious and incriminating “everything is fine” phone call. Selective memory, especially during crucial moments of a crime timeline, is a HUGE indication to me that the person is not being truthful. Circumstantially, you can absolutely surmise that OP did not want the police at his house. OP calling the Standers first before anybody else supports this. Then add to that OP moving the body and asking the Standers to take Reeva to the hospital themselves, even though she had a gaping hole in her head with brain matter coming out, indicates that he wanted Reeva’s body out of the house. I don’t know anybody who would move a body under those conditions. There are SO many elements of OP’s own story that are not supported at all by ear witnesses, physical evidence, ballistics evidence, medical examiner evidence and his own defense witnesses. Those “expert” witnesses simply were not able to support his claims. They all came to court with reports that had been written within days and weeks before their testimony – after all of the crucial State’s witnesses, as well as OP, had already testified. You can absolutely add that to the pile of circumstantial evidence against OP. There are many, many more items that I could list here but I wanted to highlight some of the crucial ones. Does it matter what they were fighting about, or even if there was a fight? Does it matter what the Stipps heard closer to 3am? Does it matter whether or not OP immediately felt regret after pulling the trigger? I say, no, it does not. There is a mountain of evidence that points to OP’s story not being true. If you don’t believe Oscar’s story, then it’s simple. He knew it was Reeva in the toilet room and he killed her with intent (per my points above). As Juan Martinez would say to the jurors ” he looked at each and everyone of you in the eyes and lied in your face” ..Here Nel could say ” He looked at Ma Lady and clearly lied to you each time, I proved his lies”…. Good ‘ole Juan 🙂 I’m bummed that we won’t be able to watch the Arias penalty phase live in September. OP said in his bail app that he heard a noise in the bathroom. In his plea explanation he said he heard a noise and when he went into the bathroom realised it was the window as it was open. But under cross examination he said when he heard the noise he knew without any doubt that it was the window that he heard WHILE in the bedroom. It appears on the surface as of no value, its seems obvious that he was able to say it was the window he heard from the bedroom as it was open when he went into the bathroom. But he gave 3 different verions on the noise and one would expect him to have a clear and vivid memory of the noise as it is 1 of the most important aspects of the entire evening, on his version, because it is the trigger that caused him to embark on the course of action that led to the murder of his “beloved Reeva”. How could he be so unsure of such a significant aspect of the evening? The 1 reason is because he realised after hearing evidence in court and having giving it further thought how highly improbable and suspect it is to over react the way he did in getting his firearm and screaming at intruders etc etc on his way to “nullify” the threat. So he had to fit in that he knew it was the window from the beginnign which make shis verison sound more probable in that it makes the point that he knew people were coming into his house and was desperate to protect reeva and himself. The second reason is that it is a tailored version, it never happened , there was never a noise and he, in having to constantly adapt his version, has been unable to keep up with the little twists and turns he has had to make as he went along. Both are clear indications that his version is false. Does anyone know or would anyone like to comment on the significance of the magazine rack with regards to OP saying it was in the corner of the toilet when to my mind its been proven it was next to the toilet and in fact never moved. Why is OP so desperate to put the rack in the far corner and not leave it where it was found? Here’s my interpretation of OP’s magazine rack assertion, but certainly there could be other opinions on this too… On the defense version, the magazine rack moving (wood sound) is what “startled” OP and caused him to shoot. Of course he states that he did not intentionally shoot the gun, it just kind of went off when he got startled. So he needs that magazine rack to move so he doesn’t have to be responsible for shooting the gun. Also, OP’s version states that the 4 bullets were shot in rapid succession and three bullets hit her while she was in the process of falling down. She hit the edge of the rack (according to Dixon) which caused the buttock bruise and fell to the ground. OP says she was not on the rack, it was moved all the way to the right. This is not consistent with Mangena’s very damning evidence that has her being hit in the hip, pause, falling on top of the rack, there is some length of time that occurs for her to get in a defensive crouch and the next bullet miss her. Bullets three and four then hit her while she is slumped over with her arms covering her head. The toilet lid proves her position at the time. Her sitting on that rack, and the trajectory of the bullet holes, is important because it requires time to pass (not all rapid succession) for her to get in that position and for the bullets to hit her where they did. Pause/time = OP hearing her scream, thinking, re-aiming his gun, hitting her again. In other words – intention! He cannot have that. The rack needs to be elsewhere. Does that make sense? The 2 things that i couldnt understand him denying were the following. I think its been proven that the rack never moved, the pool of undisturbed blood, blood drops and also the blood smear on the wall behind where OP alledges it was (corner of toilet) show not only that it wasnt in the corner of the toilet but that it actually never moved at all, not like he said anyway. It only would have moved slightly when she fell on it, causing the noise. This I believe was after the first shot. The other thing is that its common cause that she was standing next to the door when she was shot and if OP says the rack was in the corner of the toilet then its impossible for her to have bumped it causing him to shoot. I just couldnt believe that in the face of all the evidence he still tried to say the rack was moved, i thought i may have missed something!! Using statement analysis on OP’s testimony in chief showed only fragments of truth amid a mass of lies and deception in the period from when he got home to 10.00pm. There is too much to mention in any detail without it becoming very long winded. There is so little credible or reliable information in his testimony for this time period to work out what did actually happen from a casual bit of statement analysis. One thing to look out for in statement analysis that strongly indicates deception is the use of present tense instead of past tense.OP makes this classic error involving setting the alarm after claiming to lock the bedroom door. So it seems probable that he never set the alarm that night. Lisa, I love reading everything you write. Your site is a daily stop for me. 1. I second the hope that you’ll continue writing on the Shrien Dewani case. 2. I hope you you’ll also consider writing on what I understand is Nel’s next case, Nico Henning. 3. Please consider adding a “donate” button to your site so I/we can toss some appreciation your way. 4. Currently without an donate button what you’re doing here is a labor of love. But why? Is it just a hobby or is there some other reason you’re willing to spend so much time and effort on something like this? It is a hobby for me. I love trials and I love to write, and it’s really great getting to talk to all of you who have some fantastic insights. I don’t know what I’ll cover next (I’m based in the US) so it will likely be something here, but I am certainly open to covering another “Nel” case. I second the “donate” button! If there`s one site that deserves it, it`s this one. I have a few theories on my own for later abt this trial too. Cant wait to read your thoughts on Bias Denman! Thank you! You guys rock 🙂 My goal is to have my summary of the last week of court up on the site by Wednesday night, just in time for the closings. I would also donate to this site, our rand isnt worth much im afraid but I would still donate on principle. I eagerly look forward to your summary of the defence’s last week and hopefully , when they are done, your summary of the closing arguments. Nel is really linking up the evidence like how it was possible the ear witnesses heard different things at different times. Also about the lights being in in the house etc. Very very interesting, but I dont want to spoil it. Ill wait for the summaries here. There are some contradictions and hence errors in the States account of aspects of what likely happened. To some extent this is to be expected because they don’t know what happened precisely. However they have made some statements that should have been worded differently. The state also has some difficulties with Hilton Botha. The judge needs to see through the inevitable mess and identify what the SIGNIFICANT factors are. I think the States account is pretty straight forward. I think the majority of people think OP is not telling the truth. What would be useful is to consider the defence summary seriously and attempt to explain whether they have valid points and whether those points are significant. A key part is all the witness statements that at face value incriminate OP. It is certain the Defence will pick apart at these statements – but the key is whether errors (of timing etc) is significant. Hence if I can add a suggestion – can you please give the closing statements, state and defence, separately – and can we please take the defence statements / objections seriously – that is if we believe it is nonsense or irrelevant – give reasons why. As much as I dont believe OP version I want to be as objective as possible with the defence case. FATAL LIE BY OSCAR ABOUT THE BATHROOM LIGHT. Using PRESENT TENSE to describe what happened or what the situation was is a sure fire sign of lying. That is, the person is concocting a version from imagination and reasoning rather than recalling from memory. In the bathroom there IS limited light. Clearly he is lying and the light was on which is why he cannot remember switching it on later which is actually true as he did not switch it on. His claim that he must have switched it on is false. This corroborates the claim by the Stipps that the light was already on when the bathroom was viewed immediately after the first set of bangs. Also it explains why he failed to report or be affected by muzzle flash. OP’s version fails on this key part of the evidence. This perpetuates the myth that “guns are evil and attract violence”. The fact that I carry a gun means in the event of being unlawfully attacked I actually have a LOWER risk of injury or death, because I can protect myself. Thx, Arnold! I appreciate and understand your opinion on that. It’s a difficult topic and can be subjective depending on where you live. I can’t help but hope that someday you’ll have the time and interest in writing up Derman’s testimony. Talk about wild… all the way from Oldwage and polar bears to “Who’s on First?” with Nel. I’d love to read your take on all of that. Lets argue a point about intention to KILL an intruder behind the toilet door as per this case and see if MASIPA has made an error. That is the nature of the threat he claimed he needed to neutralise. Neutralising the threat was carried out using his gun. An uninjured intruder or only a wounded but conscious intruder would be able to shoot back so to neutralise OP’s intent had to overcome this possibility and thus just one or two bullets fired in likely non fatal areas low shots to feet etc) would not be enough. To neutralise properly really had to be with an intent to cause death or fully incapacitating injury. As precise aiming was not possible then by firing 4 considered shots in the confined space he must have been confident was enough to effectively neutralise the threat. He then proceeded to do an armed retreat down the passage on his version, which is what he could have done all along. He thus felt he had neutralised the immediate threat by the four shots to prevent a return of fire. OP’s intent had to be to desire a kill as just a few safe loose shots would (in his thinking) have permitted a likely return of gunfire. Serious injury or death were not a result of chance strikes but was the desired intent as otherwise the firing of the shots was pointless against the claimed perceived threat. 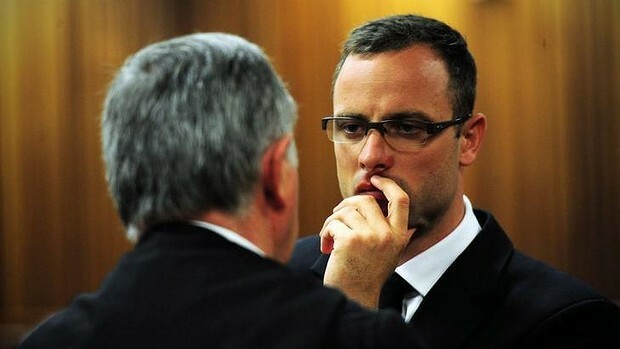 How could Pistorius not have reasonably foreseen that he would kill who he claims was unidentified behind the toilet door by discharging four rounds when the Court had been shown a video clip of him destroying a water melon by shooting from a distance with just with one bullet? The reasoning is just so bad, this Ruling can and will not stand.